As a newly minted college graduate in the late 1980s, Alston Parker Watt took her first job, with the humanitarian organization CARE, in Haiti. Between the time she boarded a plane in Miami and landed in Port au Prince to begin her assignment, a military coup had begun there. Speaking to students at Fall Convocation at Washington and Lee University, her alma mater, on Thursday, Sept. 5, Watt related that story as an awakening to the reality of the challenges that exist for those who want to make a difference in the world. The Fall Convocation at W&L is the occasion on which the University formally launches the academic year. It marks the beginning of the final year of instruction for both undergraduate seniors and third-year law students, who march in the procession. It also serves as a formal welcome to the entering students, this year’s Class of 2017. 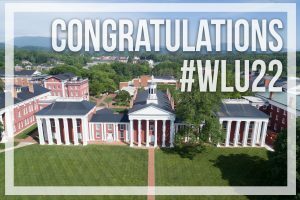 The convocation opened W&L’s 264th academic year and the 164th year of the School of Law. Watt, a 1989 graduate and a member of the first coeducational class at W&L, encouraged students to use their time here wisely and to determine how they can make the experience count. Her message was that students must have a deep belief in the worth of their efforts to better the world around them. During her time in Haiti, Watt noted, she served as a volunteer United Nations observer during the election in 1990. She described witnessing Haitians — “young, old, many disabled and barely able to walk, some being carried, some literally dying” — who waited for hours in the heat to vote for the first time. “I believe that if you hold passionately to the idea that what you do matters, each of you can help to sustain what contributes to the common wealth and to change for the better the place in the world where you find yourself — your business, profession and workplace; the schools that your children attend, your place of worship, and the towns in which you live,” said Watt, executive director of The Williams Family Foundation of Georgia. There is, she added, no better place than Washington and Lee to learn the lessons of integrity and honor that the students will find critically important to their lives. Concluded Watt: “No matter if this is your first or last year as a student to walk down this magnificent Colonnade, with its worn bricks and majestic white columns, my hope for you is that you embrace every opportunity placed in front of you by this world-class faculty dedicated to your scholarship; by the administration, who have been entrusted (along with you) to protect and further the ideals of honor, trust and civility on which all our University traditions are based; by the coaches and advisors who are devoted to developing your mind, body and spirit; and by the staff who make this place hum.